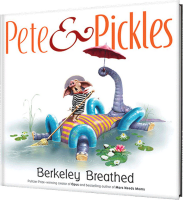 Pete & Pickles is a charming tale about Pete the perfectly predictable pig and Pickles the highly imaginative Bohemian elephant. Pete, a lonesome widower, likes his orderly life - grieving his wife, getting nightmares out of the way on a stormy night, and doing nothing unpredictable to upset his carefully cultivated routine of a humdrum life. One stormy night, Pickles enters his life (and house) in a desperate attempt to escape the circus. When the circus clown comes looking, Pete rats out Pickles who is frantically (and comically) trying to hide her massive self under the couch. However, to Pete's surprise, as Pickles is being led away she flashes a smile. This puzzles Pete, naturally. And, when he is disinfecting (oh yes, he is not just cleaning) his room the next day, he notices the dandelions that none other than Pickles could have left behind. Ridiculous, he mutters. Nevertheless, he takes a longer walk that evening and finds himself amidst the circus tents. Pete looks in to see Pickles sitting in a very dark corner of a very dark tent wearing a very locked chain. Pete suddenly, inexplicably, finds himself reaching for the key. TEA was on my schedule today! NOT elephants! whispers Pete as he helps Pickles escape, not quite knowing why. Thus begins the germination of the tiny little seed of friendship between these two polar personalities. Pickles takes Pete swan-diving off Niagra Falls. (Sort of). They sled down the Matterhorn in Switzerland. (Sort of). After brunch at Tahiti and Paris, they glide on the lazy canals of Venice. Just as Pete begins to enjoy the wild ride, Pickles apparently goes a bit too far. IT'S TIME YOU PROBABLY LEFT! yells Pete. What happens next is an unlikely event that makes Pete realize what his life would be without Pickles and he makes amends in a most touching way. Berkeley Breathed, Pulitzer Prize winning cartoonist, relates on the back flap that his inspiration for the odd couple came to him some years ago from a crayon sketch his daughter (then five) left behind at a safari-themed restaurant. Intrigued by the sketch, he asked his daughter why the elephant was putting flowers on the pig's head. The pig is sad, she said. Why? Because he is lonely, Dad. Then she leaned in and whispered But he doesn't know it. That is quite a profound statement, and sketch, for a five year old... Sophie must be quite a talented kid young lady. The digital artwork is arresting, even hilarious at times, especially where Pickles is doing a little tai chi one morning. It is a wonderfully well-written book with superb illustrations and a touching tale. However, I am inclined to think that it is more suited for older kids and adults as the presentation is somewhat mature and complex and can be easily lost on very young kids. Not much unlike A Visitor for Bear, Pete & Pickles shows us the possibility of enriching our lives if only we are willing to step out of our self-imposed confinement and comfort-zone. Seems very interesting! 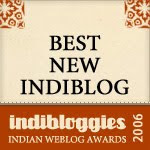 I really like the uncommon yet much needed subject discussed here - crossing boundaries to experience and enjoy. Also the combination of being funny yet touchy always keeps up the interest of kids. I have a strong feeling my 5 yr old daughter will like this book; going to find it for her soon. Thanks Sheela.